Rickard Norström and CRM from Microsoft : The CRM Email router routing emails into unexpected queues. The CRM Email router routing emails into unexpected queues. I've been working with the email router a couple of times the past few weeks and each time is a new bag of funny stuff. This jewel just keeps on giving. The latest bit of interesting behaviour I found was that when an email is sent to two or more different queues it actually gets queued in all of them. This was a certain blog topic in my little head, but just to be sure about it I did a bit of resarch and found this blog which proved me wrong in my thought that an object only could be present in one queue at a time. However, there was another thing that caught my interest and that was that a queue that isn't active on the email router can get email into it. 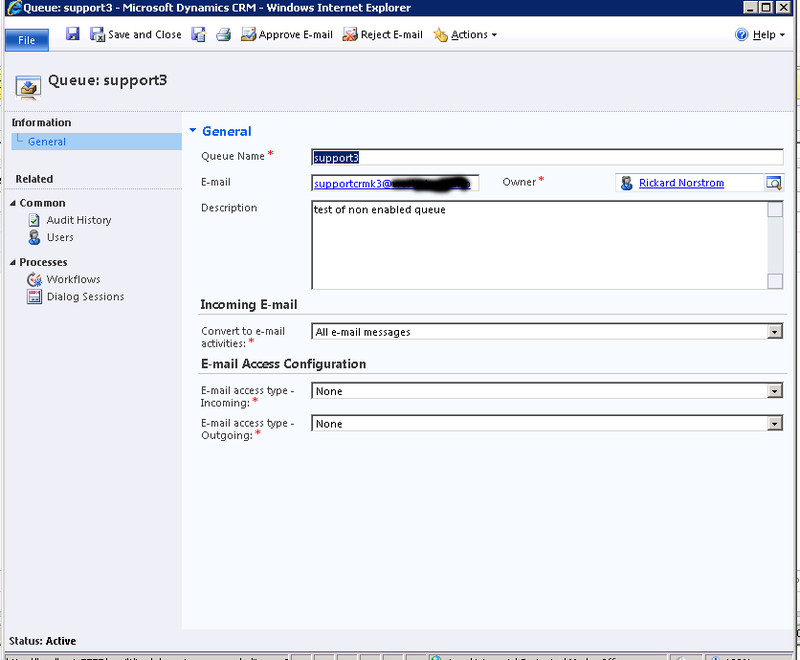 The queue support3 is set up like this in CRM and has no rule on the email router since it's just an alias. This was a bit curious since I hadn't got an incoming rule set up for the queue. This is not that exact email but I reproduced the behaviour. What happened on the customer's system was that they were re organizing their incoming email and had a bit messy system for it so they forwarded the email from one address to another mailbox and we were polling that mailbox. Now, I tried to set up a queue using the email address that was being forwarded on the emailbox that had another username. 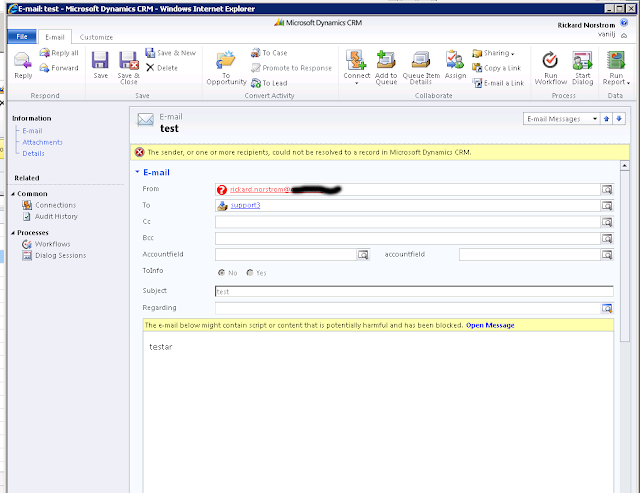 This was not so popular with the email router setup so I reverted to the email address that matched the username. In this example it is support2. 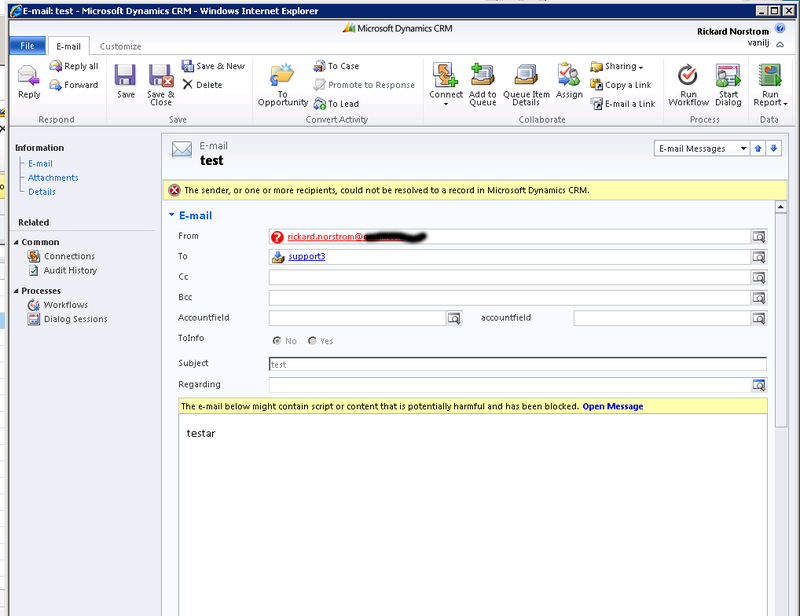 When I enabled that incoming rule on the email router, emails started coming into the queue of the forwarded email address. 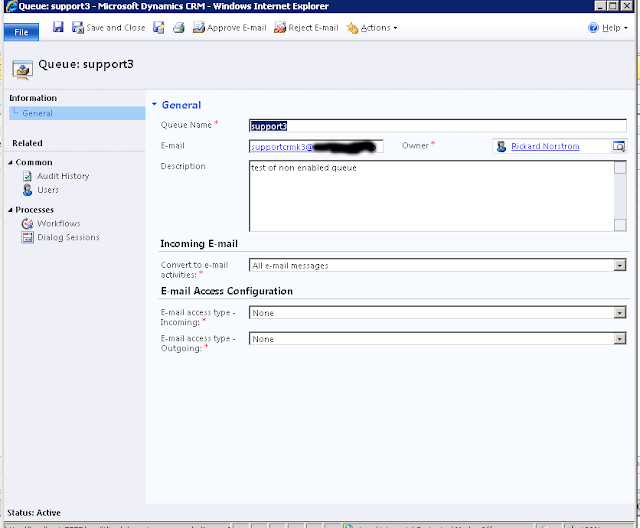 What happened was that the email router polled the incoming box of support2, finding the email addressed to support3, looked the queues and found a match in support3 and delivered the email to support3. Needless to say, I was a bit confused. I told the customer what just happened and he looked at me asking does the email enter the system and end up in the correct queue? Well, sort of, not the queue we planned it to enter, but the old queue. Fair enough, let it be, it's working. I don't know if this is the way it's supposed to work but it could be a shortcut getting email into the system using one email box and a heap of aliases. Sort of the forward email box but without having to put the original email into an attachment.